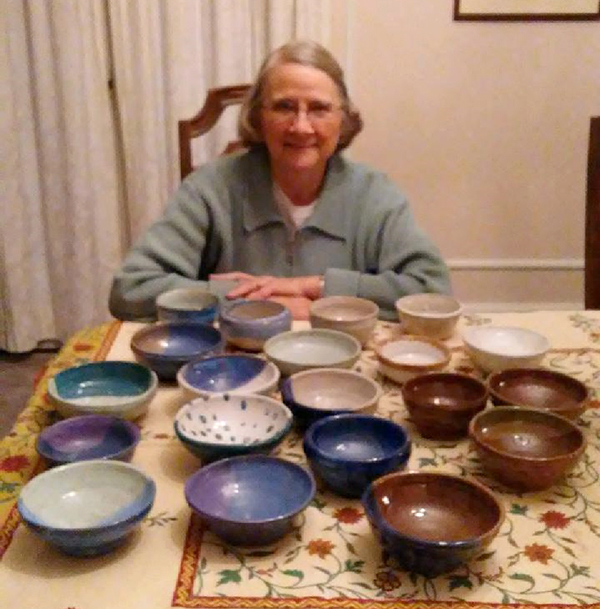 Sister Paula Gero has been making pottery bowls for the Empty Bowls project. This event, which is for the benefit of House of Bread, will take place at the Marriott near the University of Dayton on March 14, 2019. For a $25.00 donation, people receive soup, bread, and a dessert and can take home a handmade bowl. This project calls attention to the problem of hunger in the Dayton area. Sister Paula made the bowls at Artistic Expressions in Troy, Ohio. She says that the atmosphere there is relaxed and that the proprietors and other potters are friendly, cooperative, and non-judgmental. “I get completely covered with clay, including hair and glasses; they call my technique ‘combat pottery.’” She is glad to have a good reason to pursue this rather expensive hobby. Discerner Mi Kyoung Hwang, who is interested in arts and crafts, assisted her with some of the glazing.